Lecture by Prof. Eric Mazur: Turning Lectures into Learning. The strategy is a modification of RTTI, a widely used strategy and in-service-training for teachers in Dutch schools. We have implemented the taxonomy of learning activities linked to tasks in at the educational publishing company in The Netherlands. Here we used the strategy in the design and publication of text books for mathematics as well as language and history. (2) students are able to apply knowledge and skills in new situations, in combination with other skills, across disciplines, and in daily life. This is called Transfer. We have made some tasks at the level of Conceptual and Higher knowledge combined with the learning activities Apply and Integrate. 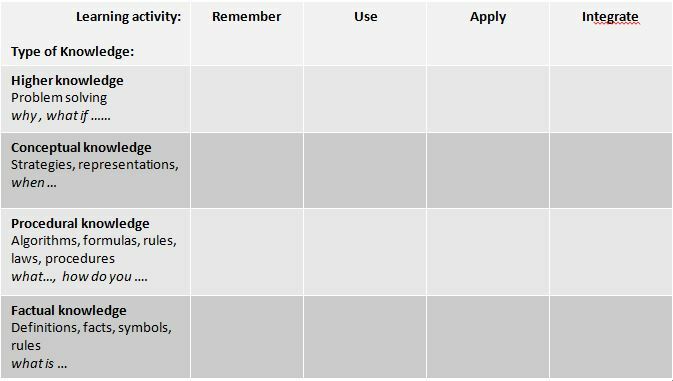 Examples of these tasks can be found in the “Brainpower“ activities and in the HOT Math series (=inquiry-based learning activities). Below you find the schema used to identify the nature of tasks within the curriculum.